The perfect recipe for a deliciously decadent pancake day! Why not be wickedly indulgent this pancake day and try Congress Conference Centre’s mouth-watering American-style pancakes with chocolate and caramelised banana? Devised by our in-house chef especially for Shrove Tuesday, they’re guaranteed to hit the spot. Mix together the flour, baking powder and a pinch of salt in a large bowl. Beat the egg with the milk, then make a well in the centre of the dry ingredients and whisk in the egg and milk mixture to make a thick smooth batter. Heat a teaspoon of oil or small knob of butter in a large non-stick frying pan. Drop a large tablespoon of batter per pancake into the pan to make pancakes about 7.5cm across (you can make 3 or 4 pancakes at a time). Cook for approximately 3 minutes over a medium heat until small bubbles appear on the surface of each pancake, then turn until golden brown. Cover with kitchen paper to keep warm while you use up the rest of the batter. In a small pan melt some butter and add a tablespoon of castor sugar. When the sugar begins to brown, toss in the sliced banana and coat with the caramel. Meanwhile, in a separate pan melt the chocolate spread. 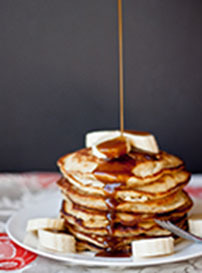 Take your warm pancakes and layer them with banana and drizzle with chocolate spread and a little leftover caramel. Serve with vanilla ice cream or whipped cream for ultimate indulgence.